The National Gallery of Canada (NGC) is doubling up with Damien Hirst in its search for identical twins who are willing to take part in a recreation of the artist’s 1992 performance “Ingo, Torsten.” Successful candidates will perform in conjunction with the NGC’s summer exhibition “Pop Life: Art In A Material World,” organized by Tate Modern and on view from June 11 to September 19, 2010. 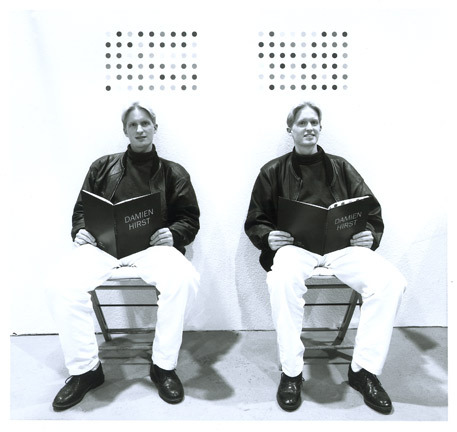 In 1992, at the Cologne Unfair art fair, British artist Damien Hirst commissioned a set of identical twins named Ingo and Torsten to spend time sitting in front of his trademark spot paintings. Dressed in identical clothing, the twins could read, knit or even play chess, so long as their actions were alike. Titled after the twins, the performance was about surface appearances, individuality, and making a scene. Now, in 2010, the NGC plans to re-stage this iconic performance and invites identical twins to take part in this recreation and to become works of art in their own right. Twins must be aged 18 or over and identical in stature, height and appearance. During the performance, successful applicants must wear identical clothes and footwear, and have matching hairstyles and hair color. Shifts for each performance will be four hours in length. Ideally, the twins will be able to commit to two to four shifts during the span of the exhibition. Twins are invited to apply by sending their name, contact information and two photographs of themselves—one full body shot and one headshot to twins@gallery.ca or by regular mail to: Twins Project, Contemporary Art, National Gallery of Canada, Ottawa, Ontario, Canada, K1N 9N4. All applications must be received by May 7, 2010. Successful applicants will be notified by email. All participants will be compensated for their time and will also be presented with a photographic memento of their performance, signed by Damien Hirst. Participants must pay for their own travel expenses to participate.